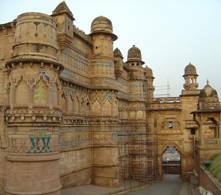 Gwalior, one of the most famous cities of India, is situated in the state of Madhya Pradesh. The city is popularly known as "the land of music, art and history".Gwalior is a very old ancient city which is blended with the rich culture of the Rajput, the Kachchwas and the Tomar dynasties. 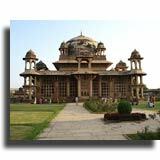 The very famous Gwalior fort and many more places are very much of tourist attraction in this city. Gwalior is housed with Asia's largest physical education institute which is the best of its kind. Gwalior, named after legendary saint Gwalipa of the eighth century and its ancient fort are almost synonym. It was when a chieftain known as Suraj Sen was struck by a deadly disease and cured by a hermit-saint Gwalipa and as a gratitude for that incidence; he founded this city by his name. Passing from legendary Suraj Sen,to Tomars in the in 14th century, it has been the seat of ruling of the Scindias.It was here that Rani of Jhansi was killed fighting the British forces. 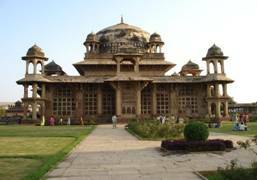 Tansen, festival of classical music is one of the major festivals celebrated in Gwalior in the month of November. This festival is celebrated mainly to promote the traditional classical music and musician and singers from different part of the country come here to participate in this musical festival. Deogarh Temple - This is a very ancient temple belonging to the 8-17th centuries. This temple is mainly dedicated to Lord Vishnu. 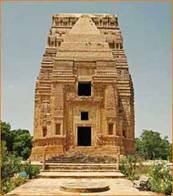 Sas-Bahu temples - This Sas-bahu temples featured by two adjoining temples which vary in sizes. Both the temples are known for their sculptures of intricate work. The walls and pillars are also elaborately and beautifully carved. 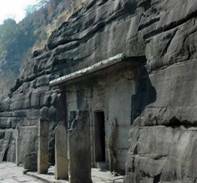 Shanichara Temple - This temple located at Aeti is about 18 kilometers from Gwalior.The most important feature of this temple is that it houses black idol of Shanideva who was held prisoner by the demon-king Ravana. Chatarbhuj Mandir - This temple situated in Gwalior is also popularly known as temple of the four armed.Chatarbhuj Mandir is dedicated to Lord Vishnu. The main attraction of the tourists here is that the temple has a massive curved structure of Vishnu. Surya Mandir Gwalior - This is a very famous temple whose exterior is been built of red sand stone whereas the interior with white marbles.Surya Mandir which is dedicated to Lord Surya is known for its architecture. Teli Ka Mandir, is known for its unique architecture whose Shikhara is built in the Dravidian and the Indo Aryan style. This mandir is full of figures of river goddesses, coiled serpents, amorous couples and a flying Garuda, the vehicle of Lord Vishnu. 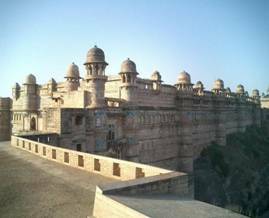 The Gwalior fort was built by Tomar Raja Man Singh symbolises the grandeur of Gwalior. Built on a 100 metre high hill with a massive wall around rising to a height of 10 metres, the fort offers a panoramic view of the town. It was also described as the pearl amongst the fortresses of Hind. Emperor Ashoka is at a distance of about 46 kms away from Bhopal. This dome shaped stupa is said to be the best of Buddhist architecture depicting scenes of Buddha and Jataka. Some of the carvings depicts the Greek attires of the devotees of that period. These stupas cover an area of about 120 feet which rises upto 54 feet. This palace is located inside the fort complex and is a six towered palace crowned with domes. embellished with superb stone carving and lattice work. 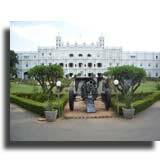 A part of this palace is used as the residence of the royal Scindia family whereas the rest is converted into a museum which the residence of the royal Scindia family, part of which has been converted in to a museum exhibiting the things which were used by the members of the royal family. The Jal vilas Palace has a pair of world’s heaviest chandeliers in the Durbar hall and a crystal staircase. Gujari Mahal a magnificent palace in stone which was built by Raja Man Singh in the 15th century for his wife Mrignayani.The palace now houses a museum with fine sculptures and replica of the Bagh Cave Murals. Datia at a distance of about 69kms from Gwalior is a medieval historical site. Its main attraction is seven storey palaces atop a hill built by raja Bir Singh Deo in the 17th century. This famous Jain Pilgrimage Centre is located at a distance of about 6 km away from Bhubaneshwar. There are about 44 caves which are nearly 2000 years old. The place has both man made and natural caves. This is one of the most favourite tourist spot. This tomb is dedicated to one of the legend in the field of music namely Tansen and is situated near the tomb of Saint Hazrat Ghaus.There is also small garden around the tomb. This is the place where the Tansen Music Festival is conducted. This temple which is located near the Residency at Morar, which is an inspiration of the famous Konark sun Temple in Odisha. The archeological museum at Gwalior has fine collection of Jain and Hindu sculptures. The museum also includes copper plates, inscribed seals, stone pillars and capitals, sati stones, metal images, terracotta and coins excavated from ancient sites like Pawaya and Besvagar .There is also a celebrated statue of salabhanjika (wood nymph) brought from the temple of Gyaraspur. This mausoleum which belong to the 16th century is situated in the old town of Hazira.Mausoleum of Ghaus Mohammed is featured by a sandstone tomb built with thee style of Mughal architecture which has followed the pierced stone technique. There is also garden around the tomb. This Museum of Music which has been set up in the old ancestral house of the legendary Ustad Hafiz Ali Khan accommodates the ancient instruments of the great Indian Masters. 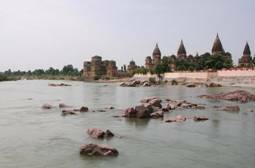 This place located on the banks of river Betwa is a beautiful historical spot with palaces, tempes, forts and parks. This place is at a distance of about 120 kms on the road to Khajuraho. About 239kms from Gwalior is famous for its Koshak Mahal built by Mehmud Khiliji of Malwa and is surrounded by hills, lakes and forests. This place is at a distance of about 120 km away from Gwalior is located amidst lush forests and undulating wooded hills. Apart from palaces, fort, lake and pool, Shivpuri is noted for its 156 sq kms National Park rich in Wild life. Rajwara, Laskar and Patankar Bazaar - traditional items like lacquer ware, dolls, handwoven carpets, wall hangings and jewelery,art and craft items. Chowk,Bara - Chanderi sarees and textiles State Government Emporiums - art and craft items, okra figurines, tribal jewelery and hand-woven sarees and fabrics. Apart from the above, Gwalior is the best place to buy chappals, moccasins, sneakers, sandals and loafers. The Indian Coffee House - Hotel India. This place is known for its vegetarian food. Kwality Restaurant - Southern fort gate. Volga Restaurant - Near the Usha Kiran Palace. The Usha Kiran Palace's- Good Indian dishes. Gwalior airport caters domestic flights which connect Delhi, Mumbai, Bhopal, Indore and Jabalpur. From Delhi, Indian Airlines has flights on Tuesdays, Thursdays and Saturdays; and Alliance Air has flights on Mondays and Fridays. Gwalior railway station lies within the city limit. It is on the main Delhi-Mumbai and Delhi-Chennai railway line. Taj and Shatabdi express connect Gwalior with Delhi and Agra. Gwalior has well maintained networks of state and national highways that connect most parts of the state and the neighboring areas.